Sacramento is a quiet town filled with endless drinking-related activities! Get your livers ready because with this itinerary, you’ll need all the help you can get! 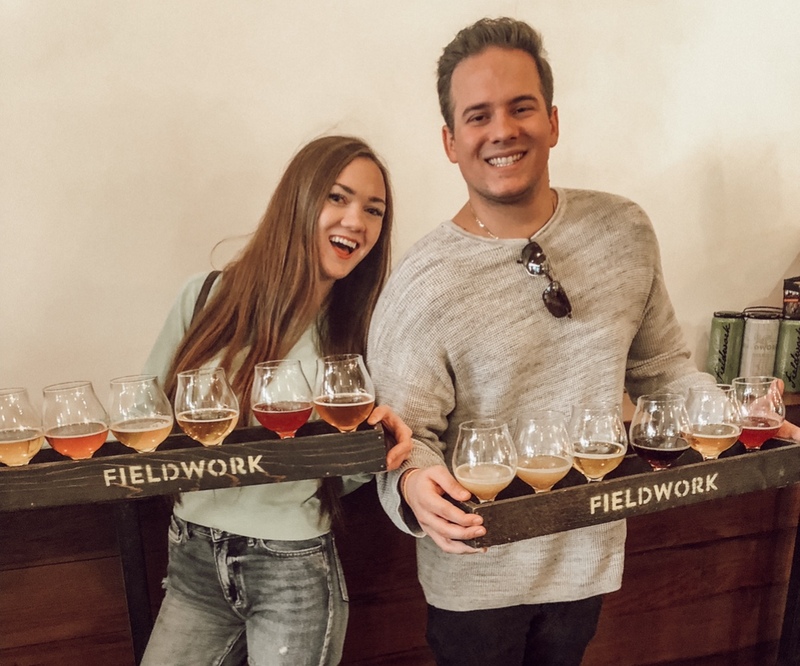 If you’re not much of a beer drinking OR don’t discriminate on your alcohol choices like meee, check out my other post Wine Bar Hopping in Downtown Sacramento! Alaro is a local, mom and pop brewery! This couple opened their doors only a few weeks before we came. Their hospitality, great beer, and adorable restaurant is an absolute must-see! Ray Ballestero, part-time anesthesiologist, gave us a private brewery tour and showed us his passion that shines through every sip! For their beer flight, you can either choose to do a custom flight of 3 beers or you can opt in to taste all 10, like me! I think it’s definitely worth it to taste all of them because they are all so unique and different from each other. See those tubes? They link up directly to either the beer kegs or vessels, are then plumbed underground and link right up to the tap behind the bar. So neat! Fare warning, Fieldwork is home to the largest flight ever! Seriously… look at these things! I would recommend splitting one of these and not trying to drink the whole thing,and fail… like me. Don’t forget to try their PB&J beer, which actually tastes just like a PB&J sandwich! Very, very strange but somehow good? It’s one of those you either love it or you hate it type of beers! Golden Road is an adorable, outdoor brewery. It has games, heaters, fire pits and the thing that calls all instagram lovers in… the twinkly lights! The 2018 deadliest California fires started just days before we got there so the conditions outside were not good. They were unfortunately closed when we got there but I got to take a peak inside and now I have a reason to go back to Sacramento! Big Stump had my all-time favorite beer, Llama Drama Pineapple Hazy! Instead of a flight, I ended up just getting a glass of this beer and was not disappointed! This brewery has picnic style seating with games, making it a perfect spot to meet other people. This two-story brewery is the perfect last stop considering they have an expansive food menu that is sooo delicious! The downstairs “cellar” area is more for flights and a brewery vibe. The upstairs feels more like a full bar / restaurant. End your night with a Sacramento Kings basketball game at the Golden 1 Center. We were lucky enough to be there the night the Lakers played and got to see Lebron James in action! This is awesome! I’m so glad I found your blog. I’m currently planning a honeymoon for someone in this area, and your posts will be so helpful!